The Market Research Event in Boca Raton, Florida, Quester was announced on the main stage as the winner of the EXPLOR Award, one of the industry’s most distinguished and respected honors. This year the entry by Quester and their client led the pack due to the great combination of business impact and research application. 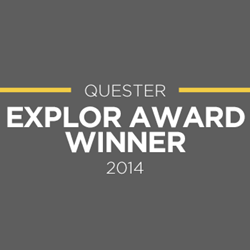 The Market Research Event, Quester was announced on the main stage as the winner of the EXPLOR Award, one of the industry’s most distinguished and respected honors. Chuck Miller, of DM2, coordinates and leads the judging committee. He shared, "EXPLOR is a case study competition, so it highlights a real-world research problem and solution. Case studies must be formed around a specific client-driven business problem, then demonstrate how the client and supplier team applied new techniques to deliver insight. EXPLOR is less about using a cool new tool, and more about how innovation solved an important problem for a client organization." "This year the entry by Quester and their client led the pack due to the great combination of business impact and research application." Miller continued, "The judges liked the research applied here – a nice segmentation approach with some interesting, cutting edge artificial intelligence (AI) probing during qualitative assessments." Tim Hoskins, President of Quester and Andrea Joss, Vice President of Research were joined by their client to accept the award. "Quester continues to challenge the status quo of traditional research. Our talented team of researchers and technologists are determined to move beyond the 90% of what is known and delve deeper into the 10% of the unknown for our clients. The partnership we share with our client continues to combine strategic business needs with our one-of-a-kind capabilities to produce insights that live well beyond the research report," added Hoskins. Quester, a Des Moines, Iowa marketing research company, specializes in conversation. Integrating close-ended questions and moderated, open-ended questions into every study, every design, and for every person, Quester exposes nuances in research missed through traditional methods. Studies are designed by researchers, conducted by artificial intelligence, and jointly analyzed by trained linguists and statisticians who bring the full and complete story to life, often through a single phase of research. The EXPLOR Award is an annual case study competition honoring innovation in marketing research. Innovation leaders from global corporations, research agencies and academia submit high-impact case studies where technology or new methods have advanced the research and insights process. Winning entries demonstrate a strong organizational impact, and helping businesses advance through the delivery of sophisticated insights.